Recent McKinsey research results showed that many companies today are in a nearly permanent state of organizational influx. Within the past 2 years, almost 60% of the companies interviewed experienced a redesign while an additional 25% 3 or more years ago. This Organizational Design flurry is due to the accelerating pace of strategic change driven by the disruption of industries. As a result, companies alter the organization every time it switches direction to deliver the hope for results. Frustratingly, only less than a quarter of the Organizational Designs are successful. Actually, companies can do better – much much better. Organizational Redesign goes beyond traditional tinkering with lines and boxes. It comprises the processes that people follow, the management of individual performance, the recruitment of talent, and the development of employees’ skills. 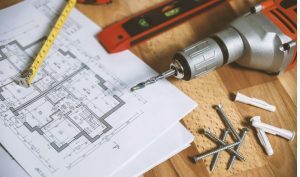 Following the 9 Principles of Organizational Design in a structured approach can increase the percentage of success and generate a greater impact on the company. Focus foremost on long-term strategic goals. Coming up with more specific goals can provide greater results. Assess the current state of the organization. A new organizational reality can radically change the scope and numbers targeted in the redesign effort. Take a methodical approach, instead of relying on intuition. When this is undertaken, a flexible operating model is established with a unique mix of strategy, people, and other assets within the company. Extend beyond the organizational reporting structure. This will allow CEOs to see which part of the company is embracing change and which is doing business as usual. Focus on roles first, then on people. When this happens, companies get to expand the number of people involved in placing talent, accelerate the pace, and increase the level of rigor and discipline. Identify the requisite shifts in mindset. Momentum is sustained when mindsets are shifted towards creating greater value. Establish KPIs for short- and long-term success. Key Performance Indicators measures the long-term impact of changes made. When these are established, companies can better track performance, new innovations, and effective allocation of resources. Management should adopt direct and personal communication. Establishing a two-way communication opens opportunities for employees to be informed of changes the company will undertake. Develop a plan to manage transitional risks. Clear Leadership accountability for developing and executing risk mitigation plans is so important. In fact, it should be built-in in the regular appraisals of managers. The rate of success in effecting Organizational Change is greater as more principles are applied. Companies with an in-depth understanding of the 9 principles are more likely to apply more than 6 principles. These are the companies that are more likely to declare victory in gaining greater results in Organizational Design. Interested in gaining more understanding on how to achieve success in Organizational Design? 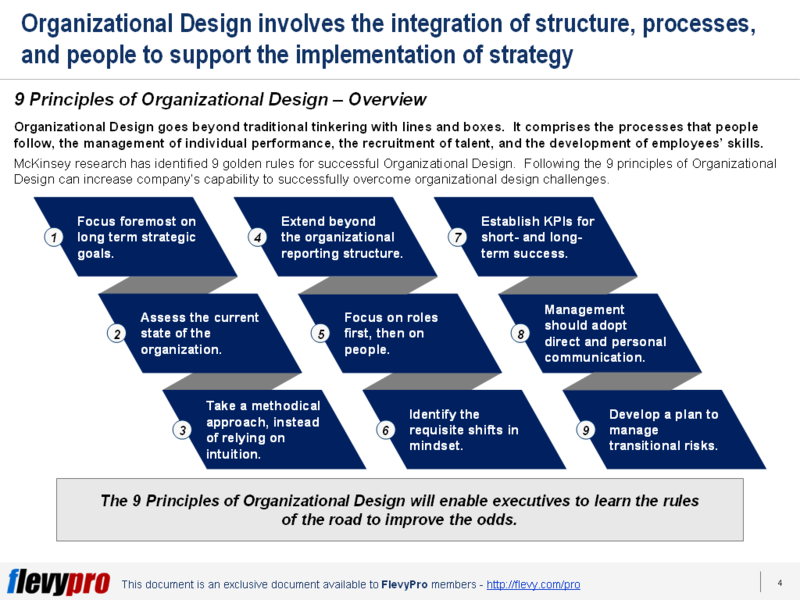 You can learn more and download an editable PowerPoint about 9 Principles of Organizational Design here on the Flevy documents marketplace.